Adding splitters and extensions allows you to extend the reach of your Aquascape® pond lighting system. 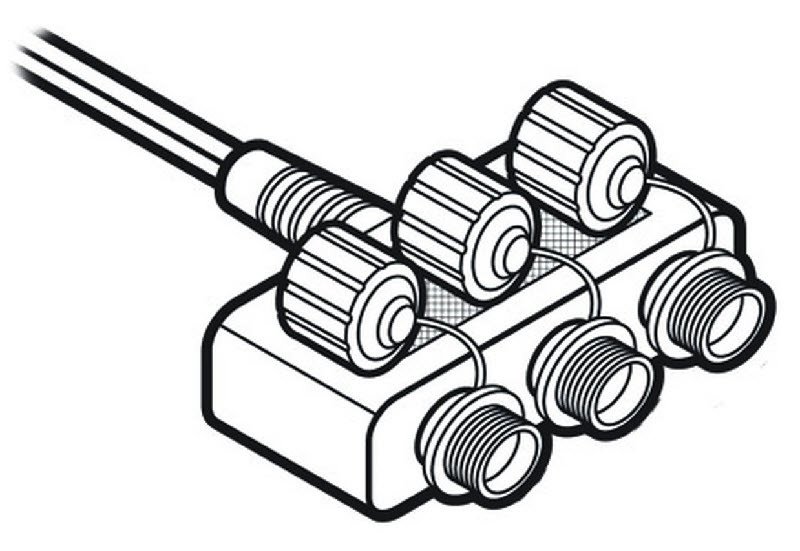 These splitters and extensions fit to the manual lighting transformer. These are all designed for Aquascape lighting with two-pin connections standard 2-pin quick connects. Turns 12 volt, low-voltage lighting on and off at set times. The built-in photocell senses the absence of daylight and automatically turns your lights on at dusk and then off after a set amount of hours, or at dawn according to the schedule you manually set. The timer setting repeats daily, turning lights on at dusk and off at dawn, or on at dusk and off after 4-6 or 8 hours later. 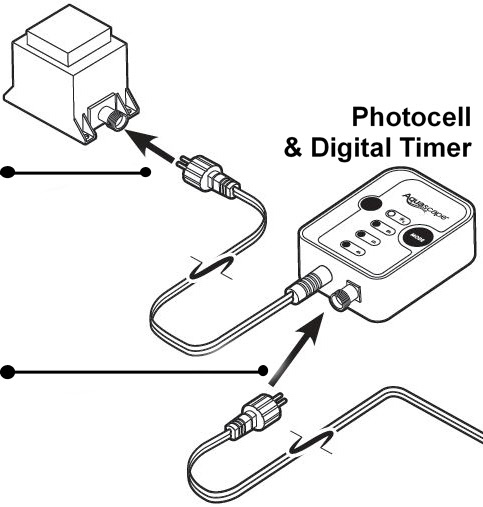 Connect the 2-pin quick-connect input cord coming from the Photocell & Digital Timer to the quickconnect found on your 12 volt transformer. coming from your lighting component to the 2-pin quick connect output located on the Photocell & Digital Timer. - Provides a simple connection of three light fixtures to a single transformer. - Multiple 3-way quick connect adapters can be chained together to attach additional fixtures. - Each quick-connect point provides a water tight seal. 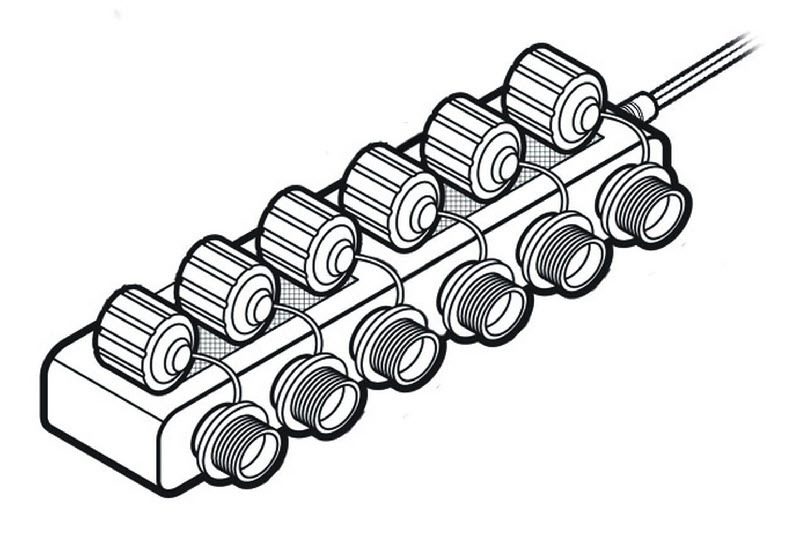 - Multiple 6-way quick connect adapters can be chained together to attach additional fixtures. - This new extension cable allows for simple extension of Aquascape lighting up to 25'. - Quick-connect point provides a water tight seal. 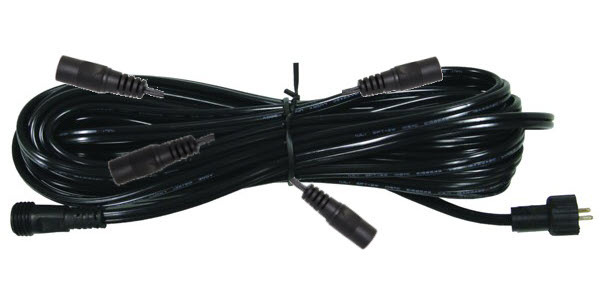 - 25-foot cable with 5 quick-connect points (at 5 ft. intervals) allows simple extension of Aquascape LED lighting.